A compact design. With all the right options. 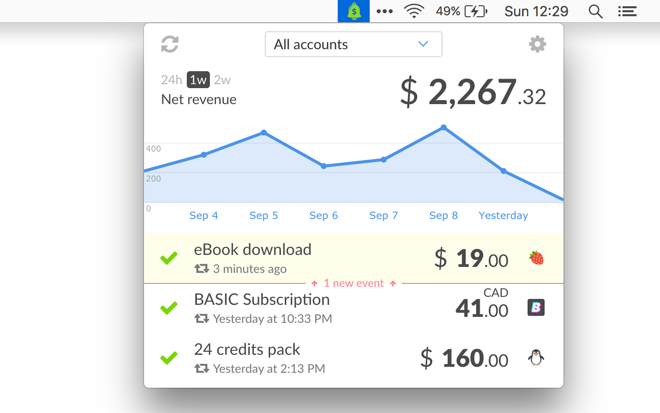 CashNotify is a menu bar app for Mac and Windows. The icon’s color indicates when something new happened in your Stripe account(s). 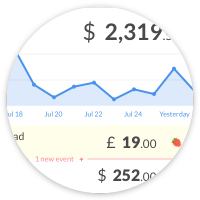 CashNotify lists 4 types of events, identified by an icon. You can customize which type of events you’re interested in. Only these events will be displayed and trigger notifications. Clicking on an event expands it to show its details. The “View on Stripe” button opens stripe.com on the page for this particular event. There’s an equivalent button for PayPal events. The details include the customer’s info and the fees applied to this transaction. The fee details are especially useful when a currency conversion occurs. If they apply to your transactions, application fees and taxes are also listed. There are several reasons why you may want to be notified of failed payments. A charge can fail when Stripe flags it as having a high risk of fraud. Stripe blocks these charges to protect you from disputes and fraudulent payments. The details show the impact of a refund on fees. It’s especially useful to understand the consequences of a partial refund. date is Stripe’s estimate of when the money will arrive. CashNotify displays a native notification when an event happens. The logos on the right are the Stripe accounts logos defined by you on stripe.com. You can turn notifications off entirely. The menu bar icon’s color will still change to alert you of new events. 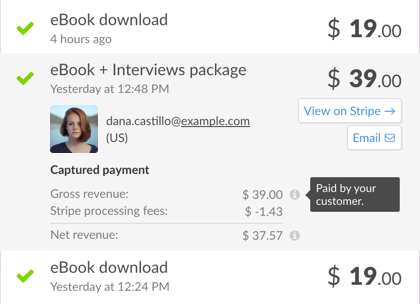 To add an account, copy/paste the corresponding API key from your Stripe or PayPal dashboard. The account’s name and logo are imported automatically. When you have multiple accounts, the account’s logo is displayed on each event to identify them quickly. Use the select to focus on one particular account. 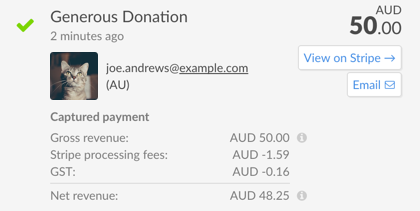 The dashboard shows an aggregate of your revenues on the selected period. Our graph of “net revenue” is an estimate from payments after fees, refunds and disputes have been deducted. It is consistent with Stripe’s dashboard. Read more in our post about net revenue. If you have multiple accounts in different currencies, you can choose which currency to use for the graphs. Your security and privacy are of utmost importance. None of your financial data ever reaches us. Everything happens between your computer and Stripe or PayPal servers, with no intermediate server involved.